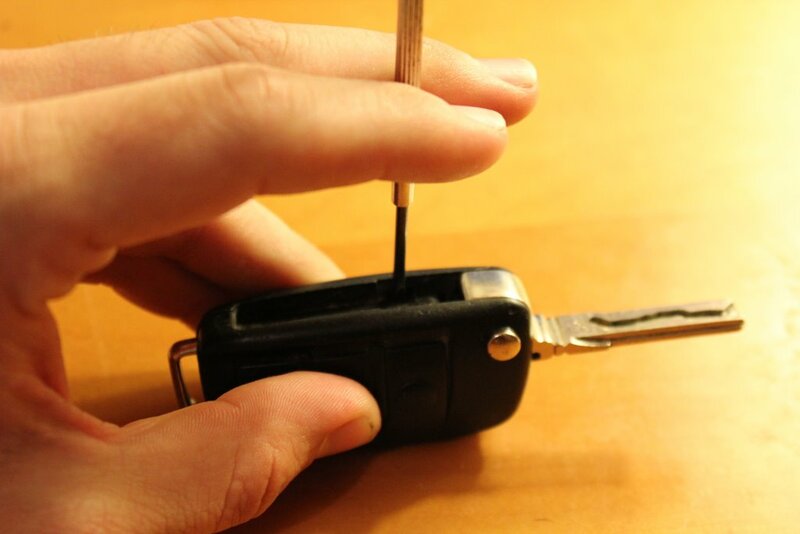 If you’re anything like me, the battery died on your first key fob a long time ago, and then you switched to your second backup key fob and now its battery has run out too – so it’s well past time to change the batteries. You could have the dealer do it, where I’ve heard estimates range between $80-150 per key…or you could do it yourself for about $5 in under 5 minutes. Needless to say, I took the later route, and I’m here to tell you it’s very easy to do – simply press in two tabs on the key, pop off the back cover, replace the battery, and then press the rear cover back into place. You’ll also need to re-program the key, which is as simple as turning the car on/off 5 times. 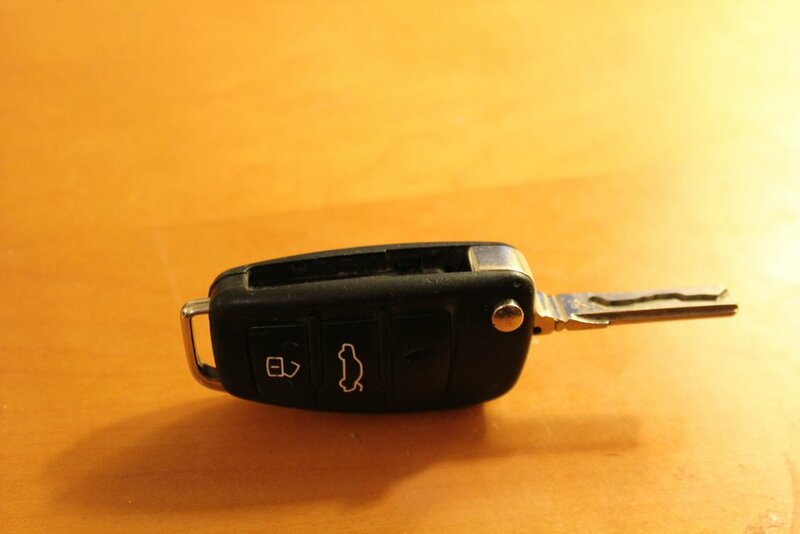 This article applies to any keys that look like the one pictured above, most notably the B7 platform Audi A4, S4 or RS4, which was produced from 2005.5-2008. Other Audi models from this date range also share the same key, and the instructions should apply to those models too (although reprogramming the key for your car may differ slightly), however I can’t confirm which other models this applies to. 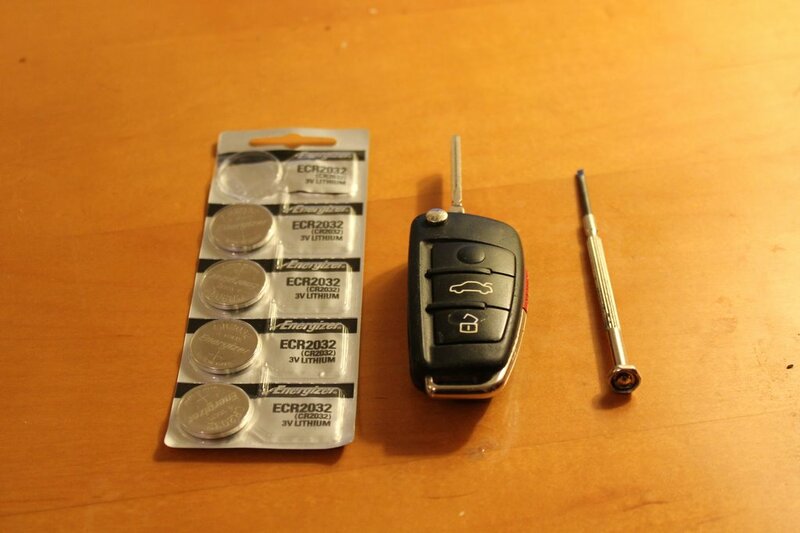 1 CR2032 Battery (per key fob) – I purchased a 5 pack on Amazon for $5 which allowed me to replace the batteries on both of my key fobs as well as have a few extras for down the road, but you really only need 1 per key. A small flat-head screwdriver – those for eyeglasses work great, but any screwdriver should be fine. A pen would probably work if you’re in a pinch, but be careful not to do anything that would leave a mark or print on the key. Step 1 – Press in the tab located along the side of the battery where the key folds in using your small flat head screwdriver. You’ll want to press it hard enough that the back cover starts to pop out. Step 2 – Press in the second tab, located on the bottom of the key. You’ll want to press hard enough that the rear cover is pretty much completely popped off, and then you can simply just remove the cover with your fingers. Step 3 – Replace the battery, making sure the positive side of the battery is facing up. Step 5 – You will probably need to reprogram the key. 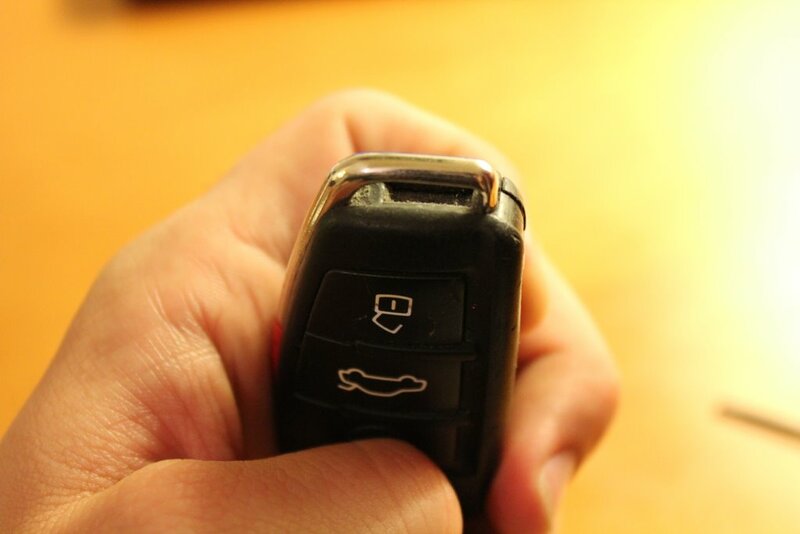 To do this simply insert your key into the car’s ignition, then turn it on/off 5 times (do not start the car, just turn it to the ON position right before a full start). This will reprogram the key. If you do not see a red light when you press lock/unlock on the key fob, either the battery is installed incorrectly, the battery is dead, or there is some other issue with your key fob (e.g. water damage) preventing it from sending a signal. 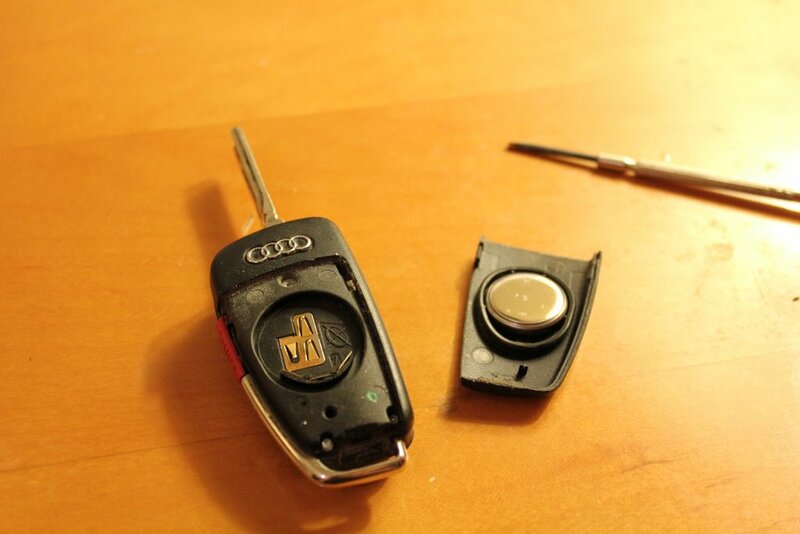 Replace the battery and be sure to have the positive side of the batter facing outward, and then order a new key fob if that does not work. If a red light appears when you hit lock/unlock on your key fob, but the doors do not lock/unlock, you need to reprogram your key to the car. The reprogramming process may vary by your specific model, so if you do not have a B7 platform Audi A4, S4 or RS4, try Googling the instructions for your specific car. In the owner’s manual it tells you to place a quarter under the backside lip under the key loop, then pry the back cover open using the key loop as the fulcrum. It worked easily for me. Interesting – but how do you release the other tab on the side of the fob where the key folds in? Do you by chance know how to get a replacement key without paying $150 bucks for it plus programming? You can find the key pretty cheap on eBay or sometimes in the Audizine.com classifieds, but you’ll still have to get it cut & programmed by the dealership unfortunately. Dude! Thanks for the write up. Nick, I have an 02 a4 Quattro, having locked the car then not being able to get back in via the fob, I assumed it was the battery. I replaced the battery, then as according to the handbook locked & unlocked the car with key to re-sync. This was ineffective. After reading your post, I also tried the ignition on/off turn 5 times….still nothing. Any ideas? Do you have another key fob you can test? Is it possible your key fob got wet or otherwise damaged? Yes….my second key works ok, the first one hasn’t been dropped or gotten wet….so I assumed it must’ve been battery. Just don’t want my spare to do the same. Thx for response anyway Nick. Tried this, but didn’t work, at first. Then, after the 5 on/off cycles described, pressed and held the unlock button for a few seconds while the car was on – that appeared to be the final step – 2008 A4 Cab. It shouldn’t be too hard, most interior panels are just held on by clips; however, I have not done this before so I can’t verify. Nick, wow thanks so much for this article! Saved me from a huge headache! You are a star, I found on other site, the instructions how to change the fob battery. I followed instructions and the little red light on the fob flashed, but did not lock / unlock. I checked my spare key did the same, now this key not work, so now x2 keys neither working. Nice writeup, but cant seem to get this to work for one of my keys. 06 a4. Fresh battery, lights up but no action on button push. Yeah i tried that too, no dice. Both ways. Few times over past few days. Think the chip is bad? @Will – possible, I’d take to an Audi dealer and see if they can diagnose or reprogram for you. Nick! i was just reading your article like it was my bed time story, and i ran downstairs to do the 5-time key recoding thingie and it worked just fine! now i can have happy dreams! hehe! thanks a bunch! goodnight! Just replaced my key’s battery! Thank you for the DIY instructions. Very helpful and cheaper than anything Audi would have offered me. Nick where can I get a second key from without getting raped? my Avant only came with one….. I have an Audi A4 2006. I have changed the battery on the remote key.. The red light turns on the key when hiting any buttons, but it doesnt open the car doors. The key doesnt however turn on the engine when used though.. any step by step help you can provide? Hi Nick I have a 2008 audi a4. When i press the lock or unlock buttons, the red light doesn’t turn on, but when i put the key in the key place in the back seat, it starts blinking. Why is this? And just to be clear I’m talking about the key placement thingy in the rear seats. I have an S4 too, so it shouldn’t be different. The battery is just a little dot, it should fall out. What year is your S4? Hi, thanks for sharing this. Both my keys have been flat for ages. I got 2 batteries and mini screwdrivers on ebay for under $10 delivered. I didnt even need to do the reprogramming trick. Audi’s replacement price is a blatant rort. Really prefer doing the one remote click to open just the driver’s door and hop straight in at night- seems safer and being able to get all the shopping out and not have to go and manually lock the driver’s door is life changing!! Glad it hear it helped! In order to reprogram the key there is also an another way. You just insert the key, turn it on (do not start the engine) press & hold the unlock button for 5-10 seconds, release the unlock button, then turn off, remove the key and your are done. Reprogram from the dealership or using the on/off method? Thanks for sharing this! Do this info apply to a 2013 S5 and 2013 Q5? Thanks! I’m pretty sure it’s the same, but not positive. Your owners manual should be able to verify – let me know if it works! Thanks Nick. This worked great with my 2007 Audi A4. The key was still flashing red when I pushed the button, but the battery must have been too weak. The new battery worked. One note, the first time I programmed the key it didn’t work. The second time I programmed the key I turned the key (but not the motor) on for about a one second count and it worked. Also, I was able to pop the key open by just putting another key in the depression on the end of the key. I am not sure if it is your keys per se, or something with the locking system. I agree it doesn’t sound like a bad gearbox just because it won’t lock but otherwise drives fine, sounds more like an electrical glitch. I checked owner’s manual – it tells that to synchronize a fob you have to get in the car, press unlock one time on a fob, put the fob in ignition and turn the motor on, then off, pull out the key and press again unlock – Didn’t work, lol, even though I can clearly hear a clicking noise as if the car performed some registering operation. One more thing is that since none of my remote controls work as of now, when I lock the car mechanically with fobs or valant key, the alarm is armed and red diode flashes, but after 20-40 seconds the alarm starts to ring – just the sound, not the emergency lights…efficiently preventing me from locking my own car..
Hi Vinesh – hard to say exactly, it could be that the battery is going bad so the signal is pretty weak. You might want to try replacing the battery and see if that helps. Your instructions were so simple and easy to follow that I had my second key working in two minutes. Just got the battery replaced and FOB reprogrammed based on your instructions. Very helpful indeed, thanks! 2007 A4 – A fob-less spare key starts the car and immediately dies. Fobbed key works fine. Fob-less key does have a transponder inside but no battery or electronics (just the tiny glass tube). Fob-less key unlocks the doors etc. just fine. Tried the multi on-off ignition trick and nothing. The fob-less doesn’t work if the fobbed key is next to it. Any ideas?